Livonia, MI – March 7, 2019 – ATEQ Corp. promoted Heidi Franklin to Marketing Manager of Industrial and Aviation Products, USA. Franklin will be responsible for managing the marketing activities for ATEQ’s leak testing and aviation divisions as well as overseeing the communications of the recently acquired aviation adapter company, Cobra Systems. “Heidi is an amazing and dynamic marketing professional. Her added years of technical experience working with engineers to market testing products make her the perfect person to promote our advancements in leak testing and aviation. She is my go-to person for everything communications related. To say she is a valued member of our team is an understatement. I am thrilled Heidi is being recognized for her accomplishments and I look forward to being a part of her continued success,” said Susan Johnson, Cobra Systems Product Specialist. In her position as Marketing Coordinator, Franklin was instrumental in designing marketing materials, planning tradeshows and managing digital marketing platforms. Franklin’s Henry Ford College Graphic Design degree has allowed her to creatively develop new marketing materials for ATEQ and Cobra Systems from websites to brochures to exhibition booths. As ATEQ has continued to grow, Franklin’s B.A. degrees in both Communications & Business Management from Hope College was put to good use by training and managing several new additions to the marketing team. Franklin brings with her 8 years of B2B marketing experience in the technical field of engineering testing instruments. ATEQ is a global manufacturer of measurement testing equipment for the manufacturing, TPMS (Tire Pressure Monitoring System) and aviation industries. ATEQ Aviation and Cobra Systems are happy to welcome new Product Specialist, Susan Johnson. Susan will handle inside sales for Cobra Systems and work closely with ATEQ’s marketing coordinator, Heidi Franklin, on communication initiatives. “I am thrilled to have someone on board with years of communications experience to assist me with marketing the new ATEQ-Cobra brand,” said Franklin. forms of marketing, internal communications, and sales resource tools. Her previous experience, as well as her connection to the aviation industry, means she will integrate well with the Cobra Systems team to continue the good works in the advancement of pitot-static testing. Susan comes from a family of aviation enthusiasts including her daughter who is an aircraft maintenance technician. She is a proud Mom, animal lover and award-winning cook. She resides in Plainfield, IL with her family and two dogs. “In previous jobs I had to use a lot of old heavy aircraft testing equipment. I’m excited to work for ATEQ because I can see the change they are bringing to the aviation maintenance field with their compact equipment and advanced technologies. I want to be part of ATEQ’s journey,” said Zavala. Zavala has six years of aviation maintenance industry experience as an Electrical and Environmental Systems Specialist, working with the US Air Force, C130, C17, C5 and B52 aircraft. He went to school for aviation technology and is currently pursuing a degree in electrical engineering. In his spare time he enjoys woodworking, playing guitar, records, and video games. “Elias has already proved to be an incredible addition to our aviation division. He has the experience and skills we needed to get our new office and service center up and running. He is very knowledgeable with repairs and how to use our equipment and has even assisted at some trade shows,” said Patrick Brousseau, ATEQ Aviation North American Sales Manager. As summer came to a close and students have gone back to school, ATEQ had to say goodbye to its summer interns. This summer, ATEQ’s Aviation division was honored to have Antoine Rousseau as its Strategic Marketing Intern. “ATEQ has always prided itself on being a global company, having more than forty locations around the world. But you don’t have to leave ATEQ USA to meet employees from other countries. Dozens of countries are represented by our diverse staff right here in our United States offices,” said Heidi Franklin, Marketing Coordinator. Rousseau was in charge of analyzing ATEQ’s recent acquisition of aviation adapter manufacturer, Cobra Systems. He ran marketing analysis of Cobra Systems and their competition by gathering stakeholder feedback to identify objectives, trends and future opportunities. Rousseau, Toulouse, France native, came to ATEQ with a bachelor’s degree in International Business Finance from Toulouse Business school in France. He is currently pursuing a bachelors in Business Administration from the University of Valencia in Spain. In his spare time, Rousseau is a singer-songwriter and musician. “ATEQ entrusted me with a wonderful mission. I am thankful to have worked for this great company,” said Rousseau. Arlington Heights, IL, Release: September 2018. Aviation test equipment manufacturer, ATEQ Aviation, has recently acquired a Chicago-based manufacturing company. Since 2002, Cobra Systems, Inc. has specialized in test adapters and kits for all aircraft. Founded in 2008, ATEQ Aviation is the newest of ATEQ Group’s three divisions. Aviation takes its place alongside the Leak Testing and Tire Pressure Monitoring divisions. ATEQ Aviation has three major test equipment lines which include Battery Testers, Resistance Testers, and its flagship product line – Pitot Static Test Kits. ATEQ’s Aviation Sales and Service Department will be moving from their USA headquarters in Livonia, Michigan to merge with Cobra System’s just outside of Chicago, Illinois. Since ATEQ and Cobra attend the same tradeshows in the US, the two will partner up and co-exhibit in not only America but at new international tradeshows. While many aspects of the companies have been merged, for the immediate future Cobra and ATEQ will continue to operate under their individual brand names. Join ATEQ at the AEA East, West and Central Connect Conferences. The annual AEA Connect conferences are two-day events that personally connect general aviation industry professionals. Formerly known as the AEA Regional Meetings, the AEA Connect conferences have grown beyond simply receiving regulatory updates and technical training via a classroom-style lecture — attendees are now more engaged than ever in the educational environment with interactive discussions and analysis. Avionics repair stations, manufacturers, regulators and educators show an increasing desire to come together, network and personally conduct serious business — they want to connect in person. With an exhibit hall filled with the latest avionics technologies and services, attendees feel a greater personal connection with the opportunity to see, touch and feel new products and visit face-to-face with the experts. Visit ATEQ at the Regional Airline Association’s Annual Convention September 23-26 booth #351 at the Long Beach Convention and Entertainment Center. Whether it’s learning about RAA’s efforts to recruit the next generation of aviation professionals, participating in educational sessions, or networking with potential customers, there is no shortage of opportunities at RAA for you to join in! 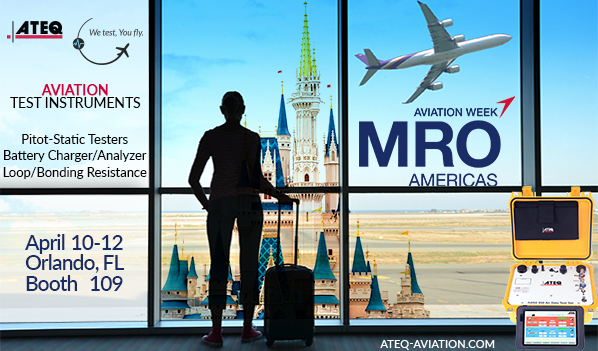 ATEQ Aviation invites you to meet our team at MRO Americas at booth 109. MRO Americas is the world’s largest conference and exhibition dedicated to aircraft maintenance. ATEQ has developed a wide range of testing instruments for aviation manufacturing and maintenance. ATEQ’s automated compact pitot-static testers are easy to configure, cost effective and can be used with any type of aircraft in hangars, tarmacs, labs or workshops. These testers connect to the pitot tubes and static ports on aircraft simulating flying conditions to test the accuracy of the pressure dependent on-board flight equipment such as anemometers, variometers, pressure sensors, air data calculators, etc. ATEQ also offers battery charger/analyzers, leak testers and bonding & loop resistance instruments to test the aircraft for electrical continuity. to let us know how ATEQ can help you! FOLLOW ATEQ AVIATION ON SOCIAL MEDIA! © Copyright 2017 ATEQ Aviation. All rights reserved. ATEQ to Exhibit at AEA in Las Vegas! ATEQ Aviation has developed a wide range of accurate, user-friendly customizable testing instruments for aviation manufacturing and maintenance. ATEQ’s automated Pitot/Static testers can be used with any type of aircraft in hangars, tarmacs, labs or workshops. These testers connect to the pitot static tubes and static ports on aircraft simulating flying conditions to test the accuracy of the pressure dependent on-board flight equipment such as anemometers, variometers, pressure sensors, air data calculators, etc. ATEQ also offers battery tester/charger/analyzers, leak testers and bonding & loop resistance instruments to test the aircraft for electrical continuity.